← Is this the Year the Chicago Bulls Return to Glory? Photo courtesy of zimbio.com. Andre Ethier (pictured above) was a main reason for the Dodgers solid start in 2011. The real cause for LA's mild success though by the end of the season was Clayton Kershaw and Matt Kemp. We have hit the 15th week of “Throwback Saturdays.” It has been fun taking a trip down memory lane every Saturday. What was happening on April 28, 2011? How about on April 28, 2010? Let’s find out. The Los Angeles Dodgers have not exactly had a story book season thus far. Really not much has gone right on or off the field. Surprisingly though, the team has not completely flopped. Or at least not yet. Sitting at 13 and 13, they are still in 2nd in the NL West. With a run differential of -16, they are not exactly competitive every night. They either win big. Or they lose big. A weak run differential normally catches up with a team as they get a couple of months into the season. So the odds do not look to be in LA’s favor. But there has been one lone bright spot in Dodgertown. That bright spot is not Kobe Bryant, though his courage and amazing toughness is a shining light in that city. Say hello to Los Angeles Dodger’s star right fielder, Andre Ethier. 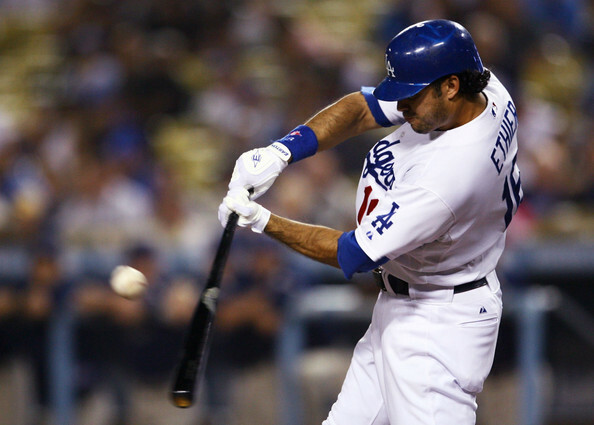 Ethier has been simply phenomenal this season, and is a main reason why the Dodgers are currently playing 500 baseball. Without him, the entire ship may have already sunk on this season even just 26 games in (To finish reading this post, click this link). I had no idea what was in store for Los Angeles. Andre Ethier got off to a great start, but ended up struggling down the stretch due to injuries (he missed 27 games). Despite all of the turmoil, the Dodgers still finished above 500 at 82 and 79. This was thanks in large part to two guys other than Andre Ethier. I am not sure how I failed to mention these two guys. Of course I am referring to Clayton Kershaw and Matt Kemp. Kershaw took home the NL Cy Young Award while Kemp finished second in the NL MVP voting. Ethier was good in 2011. But both Kershaw and Kemp were great, and the main reasons for the semblance of success seen in LA. Guys selected as the number one pick in the NFL Draft are struggling to live up to the expectations. Lets go through the last five number one draft picks (minus this year’s, Sam Bradford because the verdict is still out on him). In 2005, the number one pick was Alex Smith out of Utah. Smith has experienced an extremely up and down NFL career (mainly down though). During the course of his five year career with the 49ers, he has an overall record of 37 and 43 and a very unimpressive QB rating of 69.2. Smith has only played in more than 11 games during one of his five seasons. And the 49ers have not exactly been a quarterback heavy franchise since the retirement of Steve Young. Will he pan out eventually? Who knows. But I do know that he has vastly under achieved and not lived up to the expectations. In 2006, the number one pick was Mario Williams out of North Carolina State. This was one of the most debated number one picks in recent memory. Many thought that the Texans should have went with then, a can’t miss player in Reggie Bush or former Longhorn QB Vince Young (both have had issues). The ironic thing is Williams has panned out better than most other number one picks. He has made two Pro Bowls in his four year career and really been a game changer for the Texans. But he has not been able to quite get his team over the hump and make the playoffs. This is a guy who goes against my argument of number one picks struggling to deal with the lofty expectations placed on them. It will be interesting to see if he continues to put up strong numbers. 2007 saw our good friend JaMarcus Russell enter the NFL. This guy was supposed to be able to lead the Raiders back to the playoffs and get them back to being a consistent contender. He was supposed to be the savior and bring the proud Raider Nation back to the promised land. Boy were they wrong. Russell has had issues from Day 1. He had a very lofty and highly public lockout before he even signed for his rookie season. By the time he finally signed, his rookie year was pretty much lost. And he has really struggled ever since. His numbers are abysmal in every respect. He has thrown five more interceptions than touchdowns in his career and has a horrible career QB rating of 65.2. Not to mention he has had consistent problems with his weight and the Raiders have been horrible since his arrival. This relationship has been hell from the start. I am not so sure Jason Campbell will be able to make the difference. But will a team pick up Russell? This remains to be seen (To finish reading this post, click this link). Last year’s number one pick Cam Newton met and exceeded expectations in his rookie campaign. Sam Bradford also had a great rookie season in which he really turned some heads (can’t say the same for year number two). Even Alex Smith seems to have finally righted the ship. The trend for number one picks “was” bad. Now it has become good. I fully believe Andrew Luck will have a solid rookie campaign and have the Colts back to winning on a consistent basis in a couple of seasons. Stay tuned for the next edition of TheSportsKraze. This entry was posted in Miscellaneous and tagged Alex Smith, Andre Ethier, Andrew Luck, Cam Newton, Clayton Kershaw, Indianapolis Colts, Jamarcus Russell, Jason Campbell, Kobe Bryant, Los Angeles Dodgers, Mario Williams, Matt Kemp, NFL Draft, NL West, Reggie Bush, Sam Bradford, Steve Young, Vince Young. Bookmark the permalink.